On Thursday, the U-16/17 age group opens up play at the 2018 Girl's U.S. Soccer Development Academy Winter Showcase, while the U-15s will play their second of three matches in Lakewood Ranch, Florida. Midwest United is running rampant in the Mid-America Division and head coach Tony Deakin is excited for his team to test itself against the rest of the best from across the country. The Grand Rapids, Michigan club is unbeaten in its last eight matches and averaging just above three goals a game. A lot of that is due to the dynamic and fluid interchanging of positions from United's front-three in Brittney Probst, Anna Bennett and Elle Otto. Probst has four goals in her last five games while Anna Bennet has also hit a rich vein of goal-scoring form. If that wasn't enough to terrorize defenses, midfielder Regan Dalton has also chipped in with nine goals. Deakin's outfit has the offensive side down and has been working on its defensive play to make sure it's the perfect compliment. If Midwest United can get the formula right, this could be a very special season for the club. The North Carolina Courage will be excited to get the Showcase started, especially considering that bad weather along the East Coast means the club's last game was all the way back on October 28th. That shouldn't halt their momentum, however, as the Courage comes into the showcase with five wins in its last six matches, including three on the trot. Goalkeepers Emily Allen and Mackenzie Smith have combined for three clean sheets this season. At the other end, Mackenzie Geigle is already just two goals away from reaching double digits. The Courage like to dominate possession and look for its players to make intelligent decisions in order to fashion goal-scoring opportunities. When possession is lost, the North Carolina side likes to pressure immediately and win it right back. After all, if Midwest United doesn't have the ball, then its vaunted offense can't score. 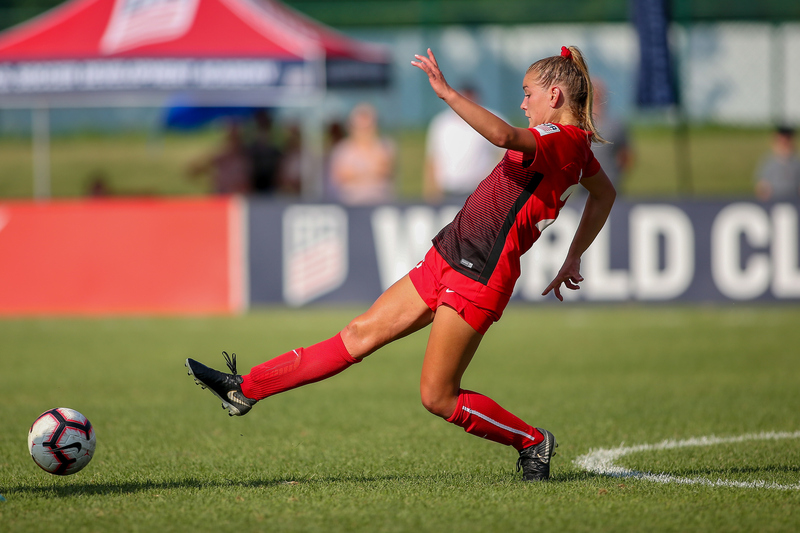 Legends FC made it to the inaugural Girls' Development Academy U-15 Championship Final last season before falling to FC Dallas in a game that was worthy of a final. While it's still early this season, Legends FC head coach Cristian Araya has his side charging down the right path. The Chino, Calif. club has won 10 of its 11 matches to start the season and is averaging three goals per game. The squad describes its style as playing, "possession with a purpose" while also being "organized defensively and really aggressive and dynamic in the attacking third of the field." The club from the area known in SoCal as the Inland Empire will face its toughest challenge yet, but pass this test and it might not be too early for observers to suggest that a return to the championship match is a real possibility. The Real Colorado U-15 side is looking to emulate the success of last year's U16/17 team that went into the playoffs seeded No. 13, but knocked off the No. 1, No. 3 and No. 4 seeds in route to taking the Girls' Development Academy U-16/17 title. Head coach Lyle Lebere says his young ladies take great confidence from training and getting to play inter-squad matches with those older players. So far, it seems to be working. Real Colorado is undefeated on the season and tied with the San Jose Earthquakes for the best defense in the DA with just four goals conceded. The Academy that produced Women's National Team star Mallory Pugh and Youth National Teamers Sophia Smith and Jaelin Howell has a reputation for combining a staunch defense with ruthless efficiency when it comes to taking chances at the other end. The one thing Lebere stresses about his charges is that they work extremely hard, but also have a lot of fun. Knock off the No. 4 team in the nation, and the girls of Real Colorado will most certainly enjoy their time in Florida.